And this will be our final day of cruising. 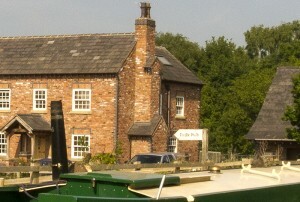 Passing a nice house, which is for sale, and a very important sign on a canal: To The Pub. 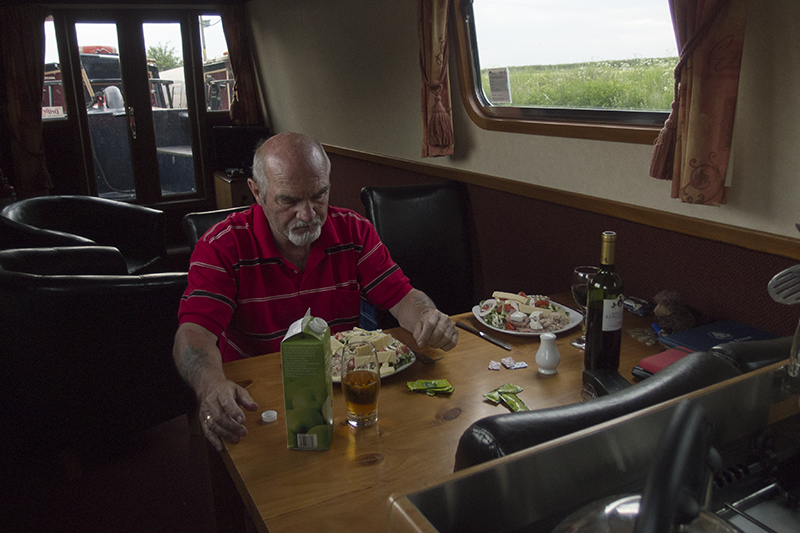 We stop at Anderton Marina, to look for a permanent mooring, but we don’t class them as being friendly. 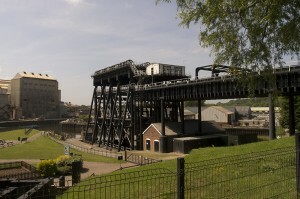 Next stop is Anderton Boat Lift. It’s open, and a day trip boat is going down onto the river Weaver, while a narrowboat and a cruiser are going up into the Trent & Mersey Canal. 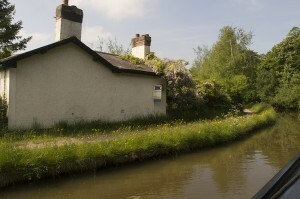 Then it’s time to make our way to Acton Bridge. As soon as I set off the lady from the ice cream boat warns me that there is something going on at the next bend. I know the bend, but all I can see is a boat blocking the entire canal. So I progress slowly, steer to the left, and Lawrance jumps off to assess the situation. No, it’s not an accident, it’s just four narrowboats trying to moor in a bend, in a space that’s just long enough for three narrowboats. So the last boat is blocking the entire canal. After all of them move forwards a touch I’m able to pass them. Then, in the next, tight bend to the left, I get oncoming traffic. A lady driver, so say no more… She doesn’t steer to the right in the bend, and, although I’m going very slow, she manages to force me into the trees. In the corner of my eye I see that they end up diagonal in the canal. And I… I’m grounded. And before I realise it, I’m diagonal in the canal as well. I know: when grounded, reverse. But I’m already in the trees. So Lawrance pretends we’re in Venice. With no result. And so we don’t have a clue what to do now. There is no other traffic, so we can’t ask for help. What to do? Lawrance once again takes the pole and walks to the bow. And all the sudden I feel the boat moving. So I say: “Stay there!” Slowly but surely I manage to get the stern out of the trees and turn the bow into the direction of Acton Bridge. We look at each other and both think the same thing: bow thrusters. We reach Acton Bridge without any more problems. Danny and his wife meet us to fuel up, so we can pay for our diesel. She is pregnant and she and Danny will be in hospital tomorrow for delivering her baby. We speak to Andy, who has a mooring at Acton Bridge. He shows us his boat, and, more important, his cassette toilet. My original plans for our own boat have a pump-out toilet, but remembering the ease with which Ian emptying his cassette toilet at Calverley, and speaking with the couple at Bridgewater Marina, we decided to go for a cassette toilet as well.